An SQL injection is a computer attack in which malicious code is embedded in an application that is poorly-designed and then passed to the backend database. This is followed by the malicious data producing database query results or actions that should never have been executed. 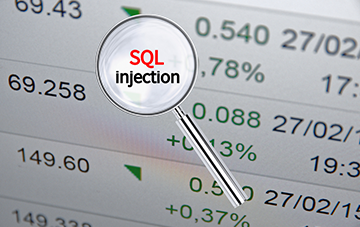 A successful SQL injection on a business could result in the unauthorized viewing of user lists, the deletion of entire tables and, in a few cases, the attacker gaining administrative rights to a database, all of which are considered to be highly detrimental to a business. Attackers will be able to exfiltrate data from servers by exploiting SQL Injection vulnerabilities in different ways. A few common methods include retrieving data based on conditions (true/false), errors, and timing. Let’s take a look at the variants. Sometimes a visible error message does not appear on the page when an SQL query fails, and this makes it difficult for an attacker to obtain information from the vulnerable application. However, there is still a way through which information can be extracted. When an SQL query fails, sometimes some parts of the web page change or disappear, or the entire website can fail to load. These indications permit attackers to determine whether the input parameter is vulnerable and whether it permits extraction of data. Attackers test for this by inserting a condition into an SQL query. If the page loads, as usual, it could point out that it is vulnerable to an SQL Injection. To be sure, an attacker usually tries to provoke a false result. Since the condition is false, if the page does not work as usual or if no result is returned, it might indicate that the page is vulnerable to an SQL injection. In certain cases, despite the fact that a vulnerable SQL query does not have any visible effect on the output of the page, it may still be possible to extract information from an underlying database. Hackers succeed in determining this by instructing the database to wait for a specific time period before responding. The page will load quickly if it is not vulnerable; if it is vulnerable it will take much longer than usual to load. This indeed enables hackers to extract data, even though visible changes are not found on the page. When exploiting an error-based SQL Injection vulnerability, attackers will be able to retrieve data such as table names and content from visible database errors. There are also instances when an attacker will be able to retrieve information from a database by using out-of-band techniques. These type of attacks usually deal with sending the data directly from the database server to a machine that is controlled by the attacker. Attackers could use this method if an injection does not directly occur after inserting the supplied data but instead occurs at a later point in time. All this depends on the capabilities of the attacker, but the exploitation of an SQL injection vulnerability can also result in a complete takeover of the web server and database. One efficient way to prevent damage is to limit access as much as possible. It is good to have a wide range of databases for different purposes, for instance, separating the database for the shop system and the support forum of your website. Getting a web security software is always considered to be a good step in preventing SQL injection vulnerabilities because trying to locate SQL queries manually is, in fact, costly and there are chances of missing out. A good web security tool will help in validating this issue by having a complete check on every single query. Even if a vulnerable query is detected, the web security tool makes sure that web page is loading properly by hiding the queries from the database. All this can be achieved using cWatch, a web security tool developed by Comodo. Install cWatch Web and benefit from the features listed below that will help you to eliminate application vulnerabilities and protect websites and web applications against advanced attacks like SQL Injection, Denial-of-Service (DDoS), and Cross-Site Scripting. Web Application Firewall (WAF): Available with malware scanning, vulnerability scanning, and automatic virtual patching and hardening engines, the Comodo WAF provides robust security that is completely managed for customers as part of the Comodo cWatch Web solution. This WAF provides powerful, real-time edge protection for web applications and websites providing advanced security, filtering, and intrusion protection. Malware Monitoring and Remediation: This feature allows organizations to adopt a proactive approach that will help protect their brand reputation and business from malware attacks and infections even before they could hit the network. Security Information and Event Management (SIEM): The SIEM, considered to be the brain of the web security stack, sends alerts to the Cyber Security Operation Center (CSOC) team in order to detect and mitigate threats for a customer before they can occur and enable them to respond in a more rapid manner to attacks. SIEM is an advanced intelligence that can leverage existing events and data from 85M+ endpoints and 100M+ domains. PCI Scanning: Comodo cWatch is web security tool providing online merchants, businesses, and other service providers handling credit cards online with an automated and simple way to stay compliant with the Payment Card Industry Data Security Standard (PCI DSS). Cyber Security Operations Center (CSOC): The Comodo CSOC is staffed with certified security analysts capable of monitoring, evaluating and defending websites, data centers, applications, databases, servers, desktops, networks, and several other endpoints for customers. These security analysts provide round-the-clock surveillance and remediation services. Secure Content Delivery Network (CDN): This is a network of globally distributed servers designed to enhance the performance of websites and web applications by delivering content using the closest server to the user and is proven to increase search rankings.